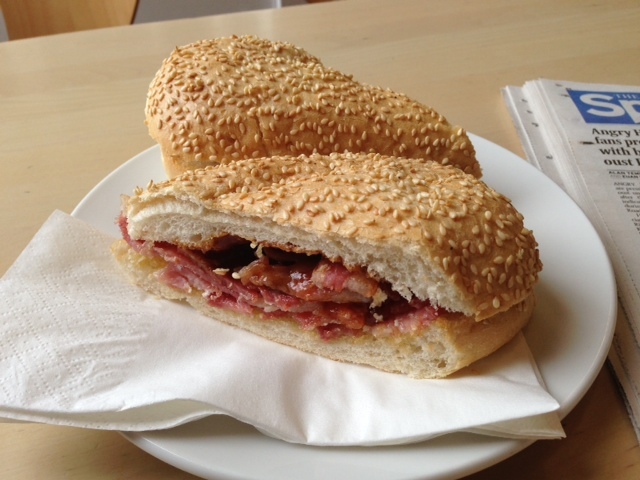 Dear reader, as proof of my competence and man-of-the-people status I am heroically this morning eating a bacon roll. Georgia Graham yesterday reported earnestly to high-brow Telegraph readers: “Nick Clegg gave Ed Miliband a lesson in how to eat a bacon sandwich, tucking into a roll live on air. I can reveal that I had mine with brown sauce. In between ‘Look a Princess!” media coverage which treats Kate Middleton like a brood-mare, the level of political debate in English politics is astonishing. Why are we discussing bacon sandwiches? Partly it’s because you couldn’t slip a sliver of grilled pork between the policy agendas of these people. Lineup 1000 people and ask them what Ed Miliband stands for and I guarantee you no-one could tell you. This is a political culture void of anything to talk about bar it’s bitchy infighting and celebrity feudalism. A constitution! A constitution?! The affrontery. Doh! This is like some massive constitutional penny has just dropped. Has Jenkins been in Narnia for the last three years? It’s not Simon, it’s really not. The one thing no-one is talking about all is the non-existent Devo Nano proposals. Catalonia, the Channel Islands, Sicily and Monaco are cited. The trouble, say the Nuffield authors, is that when you set aside nationalist rhetoric, “conceptually it is hard to distinguish devo-max from an independent country that has entered into a confederation with a larger neighbour”. Well these Nuffield scholar are very scholarly and all but they seem to be a) considering Devo Max proposals that don’t exist and any that have been put forward in the past have always been absent of control over absolutely key areas of sovereignty, such as control over natural resources, foreign affairs and defence. This is nonsense. That’s a massive assumption based on vague mutterings. Few would trust ‘Cameron and Co’ as far as they could fling them. Jenkins finishes with a flourish: “The pity is that it takes a stupid referendum to force London to concede it.” How stupid of us to have a process that’s been ongoing for the best part of 100 years, based on an agreed process and a mandate from our elected government. Careful with the scrambled eggs, now! I would never vote Labour because they take us for granted but feel sorry for Miliband – he is now being persecuted just for being a bit different in way which reminds me of appalling treatment of Neil Kinnock. On the principle that the people get the politicians they deserve and can be arsed voting for, maybe it should be a bacon sandwich in charge at Number 10? The support for basic republican issues crumbled. The simple and sensible step of taking the UJ of the flag has lost momentum. Why? That is beyond me. It will be worded differently but it will be used. The fuel of any argument has long evaporated when the opposition thinks an awkward picture of someone eating means anything beyond the fact that the man was hungry. And I’m no fan of Ed Milliband. He’s been promoted well above his own capacity. But then again, a look around the front benches suggests he’s in similar company. Meanwhile, the British print news media continues it’s nauseating, greasy slide further down the journalistic sewerage pipe. Bacon? In a seeded bun? That’s just wrong! Two slices of plain bread (and brown sauce) required. And the bacon should be fried – not grilled! In a way it’s reassuring that the Venerable Simon Jenkins and other English journalists are as bad at their job as most Scottish ones. I wonder if journalists in other countries are as lacklustre as ours and our neighbour’s. 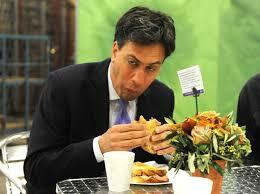 Isn’t Red Ed of Jewish extraction and aren’t they not allowed to eat pig meat? Yes Iain there are.Try Australian journalists with Murdoch mob at the helm. The level of public debate in any arena print or tv is appalling. Most of the so called journalists seem to be on some kind of new giggling drug for no matter the subject it is dealt with as if a joke. No wonder we have a new kind of fascism on the rise for this is a country which is being swallowed by US at a gargantuan rate. There is something seriously wrong with all English speaking so called democracies. Scotland has a chance to take a different path with a Yes vote so hope hope hope it does in September. ‘such as control over natural resources, foreign affairs and defence’ and the real biggy ‘taxation’. Regarding global levels of journalistic integrity, does it but patchily exist? They are not cried “hacks” for nothing. As to the “giggling” Murdoch propagandists Down Under, who is the Antipodean hysteric on BBC World “News” – the dementedly giggling gerbil on crack cocaine who seems to have replaced an equally dysfunctionally gibbering Anglo on magic mushrooms? Is this propensity towards theatrics now a compulsory Journalism 101 class along with Lying Through Your Teeth As A Core Journalistic Ethic?